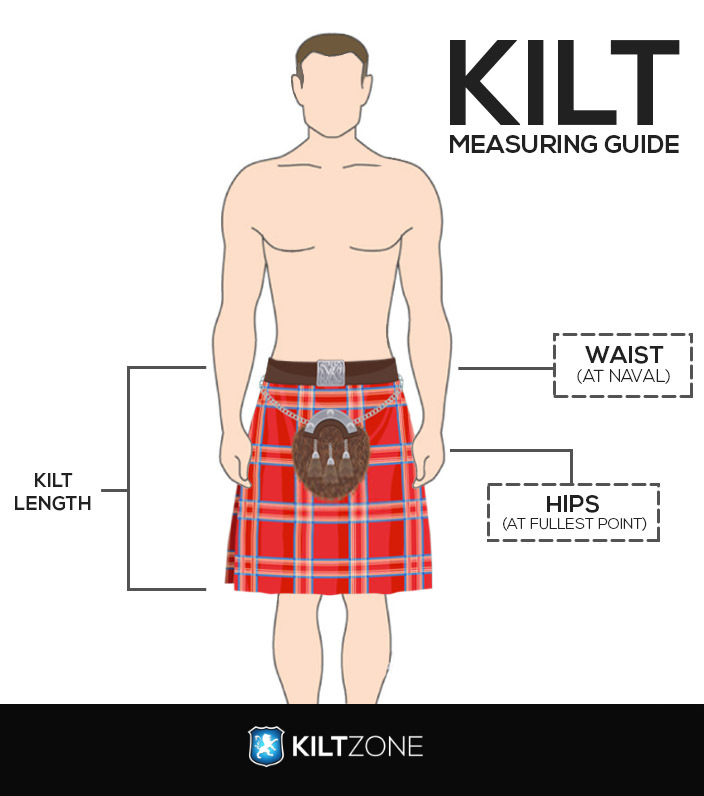 If you’re buying a kilt online for the first time then please read this guide carefully and perform all the steps given below properly to avoid any errors in the measurement of the kilt. It is very important to measure your kilt before placing an order. It is easier to measure the kilt size before rather than buying the wrong fitting and returning the item which can be costly and time consuming. Always remember that your pants/trousers size doesn’t represent your kilt size. So, here we will show you how to measure your kilt properly. The first thing that you need to do is to measure your Hip size. You might ask why do I measure my Hip size? Well, that’s because when we manufacture your kilt we must know whether you have common hip size or not. It’s because if you wear your kilt and your hips could not fit then it would be uncomfortable to wear. This second step is about measuring your waist size. Grab a sizing tape and wrap it around your waist or where you’d like to fasten the kilt. Commonly the kilt is fasten at the belly button but in the end it’s your choice. Make sure to measure it with normal breath and note the measurements down. People with large bellies might want to wear the kilt around the naval, as it provides a more flattering appearance. This is the third and the last step which is about measuring the kilt drop length size. The kilt drop length means how long your kilt should be while standing in a straight position. An ideal kilt should hang till your knee cap but it’s not mandatory, it totally depends on your choice. Start measuring from your waist or where you fasten your kilt to the point where you’d like the kilt to be. The average drop length of a kilt is around 24 inches for male and 20 inches for female.